D-Day: The Big Red One at Omaha Beach presented by author and military historian John C. McManus, Dwight D. Eisenhower and his character, and even Libbie Custer. 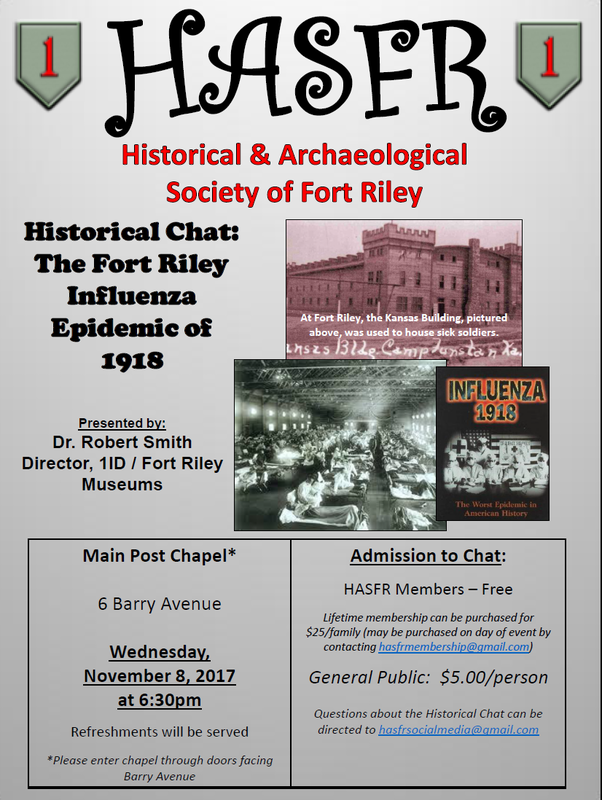 Our focus for chats is to explore the wide range of history that Fort Riley has experienced since it was created in 1855. Chats are free for members as another benefit! Admission for the general public is $5. If you are not a member but would like to become a member, please see the page by clicking on "Membership" at the top of the page for more details! Dr. Robert Smith relayed the stories of several individuals resting in the cemetery and provided details on the cemetery history. The 45-minute walking tour took visitors through the cemetery to visit graves and tombstones in chronological order. Some of the graves discussed included three Medal of Honor recipients who each received their medal in the Indian Wars, the tombstone of an unknown Confederate soldier, who is one of seven buried at the cemetery and the grave of Mary Rogers, a young woman who died during the cholera epidemic that struck Fort Riley in 1855. Using funds raised by members of HASFR, Rogers’ tombstone was restored last year after it broke in half. In addition to discussing some of individuals buried in the cemetery, Smith discussed the history of Fort Riley and events that led up to some of the graves. One such historical lesson was about a section of the cemetery separated from the rest with a small limestone wall. At the entrance of the area sits rows of tombstones set away from the other graves in the sectioned-off zone. These tombstones are the markers for the 62 German and 11 Italian World War II prisoners of war who were buried at Fort Riley, Smith said. Fort Riley was one of 600 POW camps in the United States during WWII. There were also three Japanese soldiers buried at Fort Riley, however, their bodies have since been returned to Japan. The history of events at Fort Riley interwoven with the stories of those buried in the cemetery helped to enhance and connect visitors with the installation as a whole, said Christina Mollica, wife of Capt. Anthony Mollica, 1st Battalion, 16th Infantry Regiment, 1st Armored Brigade Combat team, 1st Infantry Division. “I think it’s interesting just to learn about the posts, especially moving around so much, it’s nice to learn about the different history on each one,” Mollica said. Mollica’s thoughts were echoed by Kristen Wellock, wife of Maj. Michael Wellock, 1st Battalion, 16th Infantry Regiment, 1st ABCT, 1st Inf. Div., who accompanied her on the tour. “As military families, we don’t have roots set down anywhere really, so it’s nice to see the roots of the families that came before us,” Wellock said. Pam Sanfilippo joins us to give insight and details into the life and times of Dwight D. Eisenhower. ​ Pam Sanfilippo is the Education Specialist at Dwight D. Eisenhower Presidential Library, Museum and Boyhood Home in Abilene, Kansas, one of thirteen presidential libraries administered by the National Archives and Records Administration. Prior to moving to Abilene, Pam worked for nearly 20 years as Historian and Education Director for the National Park Service at Ulysses S. Grant National Historic Site in St. Louis, Missouri. She holds bachelor’s and master’s degrees in history, and has completed coursework for a Ph.D. in Education. She is the author of numerous articles and presentations focusing on women, including “Eliza Johnson and Julia Dent Grant” for the Wiley A Companion to First Ladies. John C. McManus talks about and answers questions related to his published book "The Dead and Those About To Die" - a white-knuckle account of the 1st Infantry Division’s harrowing D-Day assault on the eastern sector of Omaha Beach—acclaimed historian John C. McManus has written a gripping history that will stand as the last word on this titanic battle. Nicknamed the Big Red One, 1st Division had fought from North Africa to Sicily, earning a reputation as stalwart warriors on the front lines and rabble-rousers in the rear. Yet on D-Day, these jaded combat veterans melded with fresh-faced replacements to accomplish one of the most challenging and deadly missions ever. A great evening was enjoyed by those who came to listen to "Libby Custer" share stories about her life. ​​Members of the Fort Riley community got some insight into the life of Libbie Custer, wife of Bvt. Maj. Gen. George Armstrong Custer, Aug. 24. 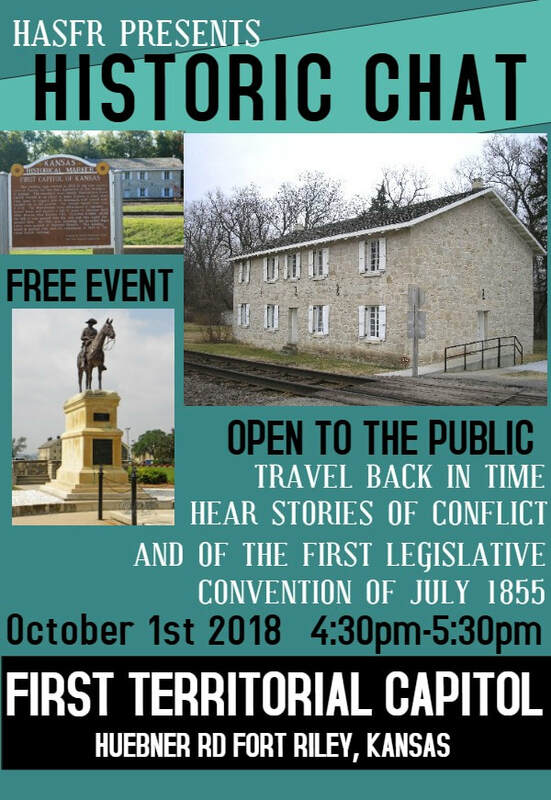 The Historical and Archaeological Society of Fort Riley President Sara Devine started the historical chats after being inspired by Fort Leavenworth’s talk series. 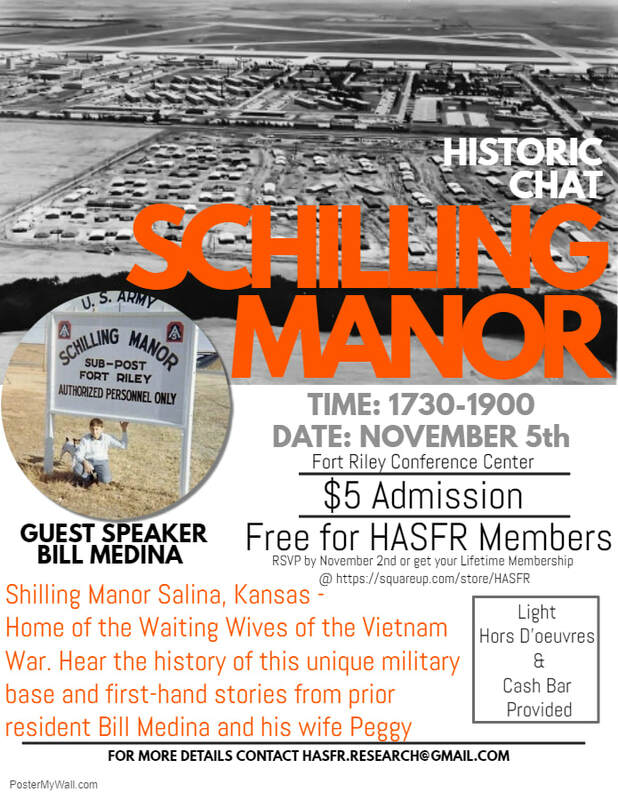 “I want the community to have the opportunity to learn about Fort Riley’s rich and diverse history,” said Devine. Libbie Custer actor Marla Matkin has been doing her Libbie Custer show for more than 20 years, performing in places such as national parks and museums in North Dakota and Wyoming. She also performed at the Smithsonian in Washington, D.C. For Matkin it lets her combine her two loves of history and theater. “I love the places and people and being able to share my passion,” said Matkin. Matkin attended Fort Hays State University where the Custer name is prominent. “When I started I wanted to use someone who had name recognition,” said Matkin. She majored in education, which helps her use her performance to educate, inform and entertain. Matkin’s act captures the life and marriage of Libbie Custer and George Armstrong “Artie” Custer. She incorporates bits about how they met at a young age, their wedding and life while General Custer was away at battle. 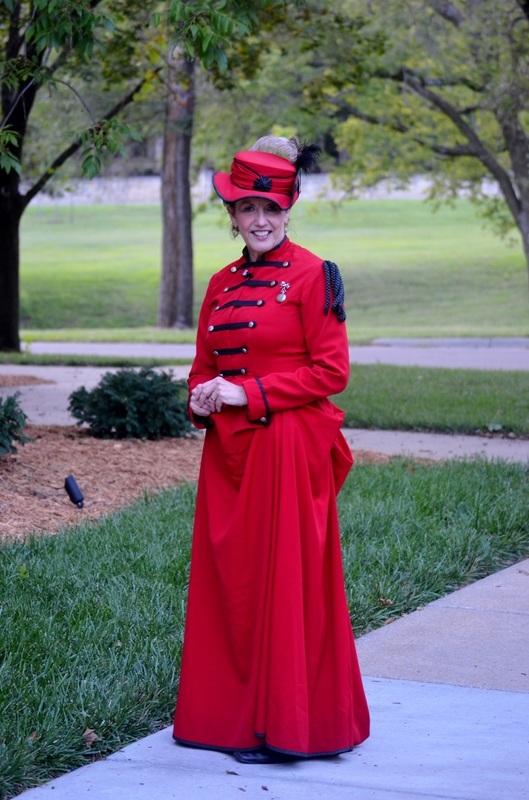 Her performance includes conversations with historical figures such as Abraham Lincoln, and it maps out different battle grounds and Army forts around the nation where Libbie and the general were assigned. Many may be familiar with Chief, the horse who is buried in the cavalry field by the Custer House. But there is another popular horse that many may not be as familiar with – Comanche. 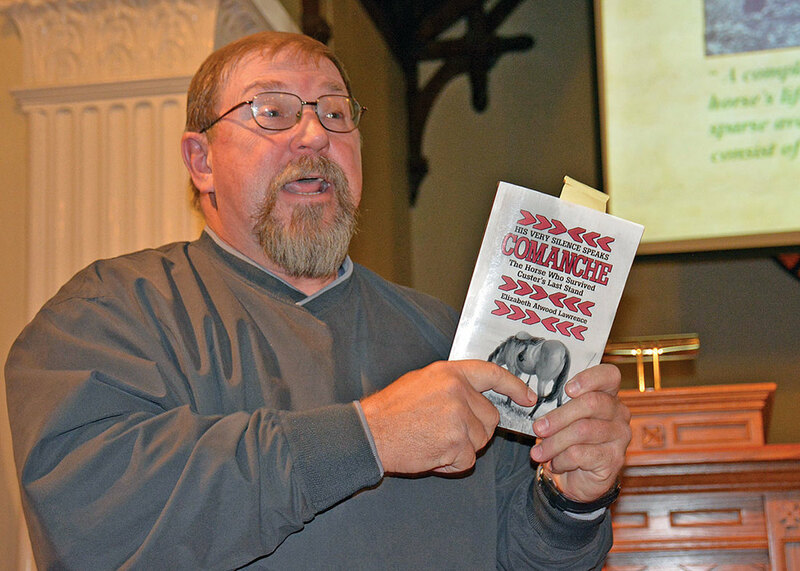 The Historical and Archaeological Society of Fort Riley hosted a historic chat Nov. 17, led by Rob Kornacki, a retired Army lieutenant, who was previously stationed at Fort Leavenworth, Kansas. During the historical chat, Kornacki talked about Comanche’s service from the time he was acquired by Tom Custer in 1868 at Fort Leavenworth, to his death in 1891 at Fort Riley. Watching the Lone Ranger’s horse, Silver, be analytical meant the Lone Ranger could send Silver into town by himself to fetch help, Kornacki said. Although he called the Walt Disney version of horses in battle as hooky, it still sparked enough interest within him to study Comanche when he was older, he said. Kornacki said half of Comanche’s remains went to Kansas State University to make a taxidermy and then sent to the Museum of Natural History. There is some mystery, however, to where the other half of Comanche lies, he said. Kornacki was the first speaker at HASFR’s new Historical Chat Series.